Father, you restored your people to eternal life by raising Christ your Son from death. Make our faith strong and our hope sure. May we never doubt that you will fulfill the promises you have made. Grant this through our Lord Jesus Christ, your Son, who lives and reigns with you and the Holy Spirit, one God, for ever and ever. According to the 1962 Missal of Bl. John XXIII the Extraordinary Form of the Roman Rite, today is the feast of Sts. Soter and Caius. Soter succeeded Anicetus as Pope in 166, and died a martyr in 175, under the emperor Marcus Aurelius. Caius, whose relics are preserved at the sanctuary of St. Silvester in Rome, governed the Church a century later and died on April 22, 296. The popes of the first centuries suffered the heavy anxiety of the persecutions which continually threatened their flocks; the pontificate of Caius, however, was marked by a long period of peace, some ten years before the terrible persecution under Diocletian. St. Soter, the successor to Pope Anicetus, died a martyr's death in 175. He was noted for his kindness to certain Greeks who had been condemned to the mines because of their faith in Christ. When he ascended the chair of Peter he forbade consecrated virgins to touch the sacred vessels and palls, or to carry censers in church. 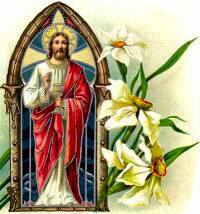 He also obliged the faithful, except those in mortal sin, to receive holy Communion on Maundy Thursday. Soter is the author of a letter to the Corinthians. St. Caius (pope from 283 to 296) was closely related to the Emperor Diocletian. So that he might live to serve the faithful, he remained in concealment a long time and would not leave Rome. Ordinarily it was in the catacombs that he hid, and there he celebrated the holy mysteries and instructed many pagans. It was Pope Caius who decreed (according to the false Decretals) that the following steps must precede consecration to the episcopate: porter, lector, exorcist, acolyte, subdeacon, deacon, and priest. He died a natural death and was buried in the catacomb of Callistus on April 22. St. Susanna was his niece. Pope Urban VIII revived his memory in Rome by restoring his church, naming him as its patron saint, raising it to the rank of a station, and enriching it with the saint's relics.